In the outdoor industry the standard wilderness medical training certification is the Wilderness First Responder. 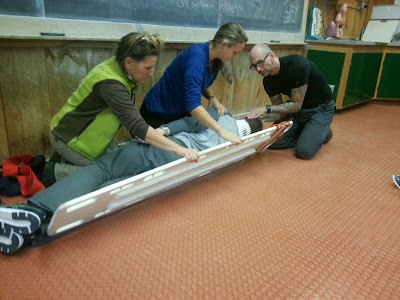 It's an 8-10 day course that focuses on managing the types of injuries an individual will most often see in the backcountry - minor issues like wound care, dealing with bites and stings, improvised splinting and how to manage an evacuation. I took my first WFR course in 1998. Since then I've taken the course again and recertified my WFR four times. During that time I led many different wilderness trips and guided many days of climbing. I became familiar with the most common climbing accidents, how to avoid them, and also how to manage them when they occur. This experience kept me familiar with much of the WFR curriculum and gave me the confidence to approach and deal with most minor climbing-related injuries. If I hadn't used my skills, I think the knowledge I gained during my wilderness medical training would have been forgotten. I still lacked the confidence to manage a major traumatic injury well. Unless you're a professional rescuer you don't use the patient assessment, treatment and management skills enough to feel good about what you're doing. I was always left thinking "Am I doing this correctly? ", or "What if I've missed something?". I had to think really hard about the sequencing of important things (airway, breathing and circulation always come first) and make sure I didn't miss anything important along the way. As an outdoor professional I like to feel confident in my skills. So, lacking confidence in an area like this didn't feel quite right. I suspect many other outdoor professionals feel the same way - managing a life threatening injury would be really hard to do well. Nevertheless, I put off taking a Wilderness EMT course because I worried it wouldn't be necessary for me to do my job well. I argued it was too expensive, too great a time commitment, or that it would be hard to maintain. These things are all true, and if everything goes just right every day you work as an outdoor professional you will never need EMT skills. Every single day isn't going to go "just right" though. Guides help rescue other climbers at the cliff, participate in search and rescue, and manage their own guest's safety all the time. When things go way wrong, which can happen, it's good to have additional skills and the confidence to use them quickly and effectively. 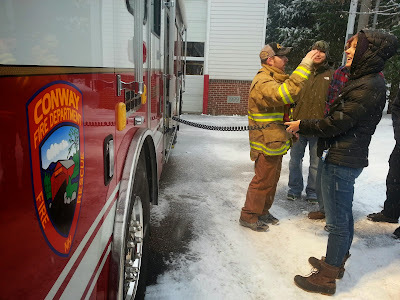 SOLO offers many wilderness medicine courses around the US throughout the year and has a staff dedicated to teaching Wilderness EMT Courses at their base in Conway. The instructors have a very thorough knowledge of the curriculum and a lot of real-life emergency medical response experience. The typical SOLO student is interested in being an outdoor professional and has a genuine interest in outdoor activities. This makes the group more cohesive because everyone shares some common interests in the outdoors. In my course there were wilderness trip leaders, university outdoor program instructors, park rangers, wildland firefighters, climbing instructors and some folks that were there just to take the EMT course there because SOLO is known for offering great programs. SOLO's Wilderness EMT course combines the WFR coursework and the NREMT EMT-B coursework. The first half of the course focuses mostly on the wilderness aspects of patient care while the second half looks in greater depth at human anatomy and physiology and helps students prepare for the practical and computer-based EMT-B tests. I found that 20 days, stretched out over four weeks felt like a really long time. I was ready to be done by the end. However, the practice doing patient assessments, splinting fractures and dislocations and performing CPR was incredibly useful. For me this is what separates the EMT (and wilderness EMT) from other wilderness medical courses like WFR and WFA. You gain much greater confidence in your skills as a rescuer. One of the arguments against outdoor professionals having EMT certifications is that it's hard to maintain the certification if you're not a professional rescuer. This is true, but many of the other professional development activities we do for continuing education as guides will also count for continuing education as an EMT. Continuing education and professional development are important and often overlooked aspects of our work as outdoor leaders. Realistically, the likelihood of a serious accident occurring is very low, but being able to think quickly and make the right decisions is really important. If you're like me (I have a strong desire to be good at my job and I'm a little nutty about organization) then consider taking an EMT course. It will give you greater confidence in your rescue skills should a real accident occur at the crags or on the trail.